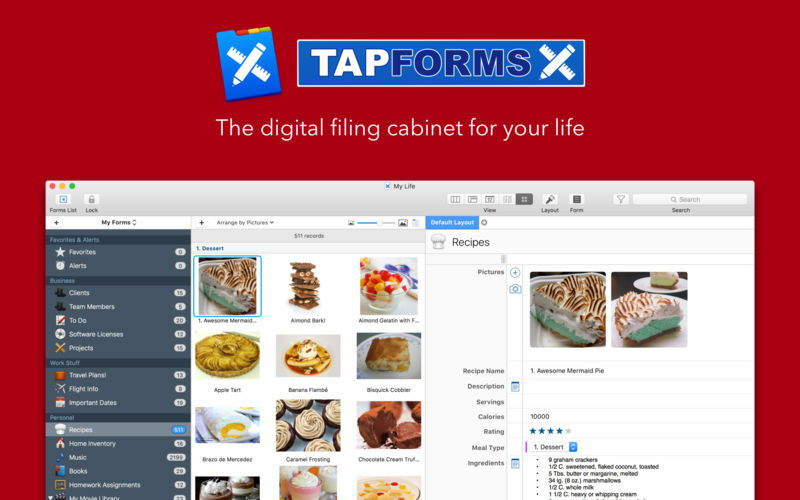 Используйте Tap Forms Organizer для отслеживания вашего инвентаря на работе и управляйте предметами домашнего обихода в домашних условиях. Отлично подходит для страховых и бухгалтерских целей! Это даже отлично подходит для управления списками подарков к праздникам или отслеживания всех ваших расходов и списков дел. Вы любитель кино, но у вас есть слишком много фильмов, чтобы запомнить? Это легко, так как Tap Forms Organizer может помочь вам классифицировать, оценивать и управлять всей вашей коллекции фильмов. Section Heading fields can now be collapsed and expanded, just like on the iOS version. Added Use Auto-Complete function to Text fields. Tap Forms will generate an auto-complete popup list of values from other values for that field in your form. Similar to Excel and Numbers. Added UUID() function to the Formula Editor to generate a Universally Unique Identifier. Added function to let you use an Emoji character to set the form's icon. Added Description property to the Field so you can describe what each of your fields is for. When you hover over a field title in your form, a tooltip will display the contents of the field's Description property. If Cloudant sync gives a request too large error, Tap Forms will now take you to the record that caused the sync error so you can correct the issue. Added support for exporting Table fields to CSV files. Fixed crash when clicking on a Table or Link to Form field table when you had no records in it. Added formula Result Type to the field properties when a Calculation field is selected. Makes it possible to see the Result Type without having to edit the formula. The formula editor now tells you what type each function returns (e.g. Number, Text, or Date). Changed default delimiter to semi-colon for the formula editor. Added support for inserting the Date, Time, and Date & Time into a Note field. Available from the new Insert submenu on the Edit menu. The Print table of records function will now print the fields in the same order they are set to on the multi-column list view.